Reiterating its long-standing commitment towards Skill Development, Toyota Kirloskar Motor (TKM) today inaugurated the Toyota Centre of Excellence at Sri Venkateshwara College of Engineering, Bengaluru. The concept of establishing Toyota Centre of Excellence at various colleges and institutes is in line with Toyota’s focus to enhance the skill sets and offer well trained-qualified workforce to the automotive industry. Through this skill initiative, the institution can be elevated to impart high quality skill standards, by providing expert trainers, facilities, and equipment. 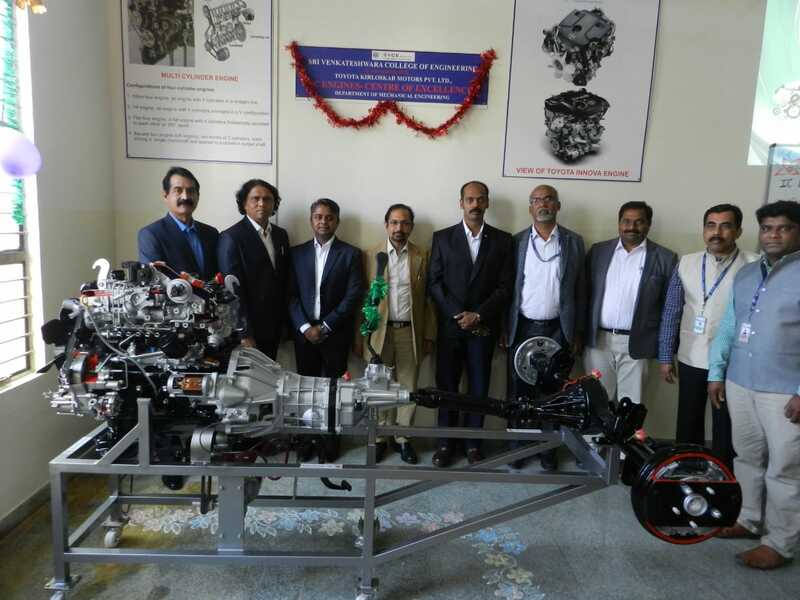 In order to facilitate in-depth knowledge of engine composition at the grass-root level, Toyota handed over one cut section of the vehicle engine and an assembled engine. The key focus is to provide comprehensive learning opportunities for the students, offering them a first-hand experience of the vehicle engine, that being the most important aspect of a vehicle. The engine cut section will showcase the component set-up in an engine and its related functioning. While the engine assembly section enables the students to gain an insight of the real orientation of the assembled engine including the dismantling and re-assembling techniques, thus achieving high quality skill sets in engine operating mechanism as part of the Skill Enhancement program. This initiative is basically incorporated to pursue Toyota’s main objectives to promote, setup, monitor, govern and regulate institutions and academies for skill excellence through development of core employability skills, competency standards and to train on advanced technologies to meet the industry demands globally. The event was graced by Dr. Shashidhar Muniyappa - Chief Executive Director and Dr. Suresha – Principal of Sri Venkateshwara College of Engineering in the presence of senior representatives of Toyota Kirloskar Motor, Mr. K V Rajendra Hegde – General Manager and Mr. M K Swamy – General Manager. Commenting on this initiative, Dr. Shashidhar Muniyappa - Chief Executive Director, Sri Venkateshwara College of Engineering, said, “Skill enhancement is a key aspect for the socio-economic development of the nation and being a member of the fraternity, I feel it is our responsibility to impart quality education amongst our students. It is heartening to see Toyota leading by example being a responsible corporate citizen through its various initiatives to cover broader societal issues. Over the years Toyota has pioneered in manufacturing cars of global standards, Quality and Excellence being their DNA. Expressing his views on the occasion, Mr. Naveen Soni - Vice President - Toyota Kirloskar Motor, said, “The pace of learning and innovation in a country is critical to economic success. Specialist skill shortages often emerges affecting the quality outputs. Governments, Corporates and Training providers need to work together to fill these critical skills gaps. Toyota focuses to create a platform to make available steady supply of highly skilled workers to boost productivity and sustain the growth momentum. One way to do this is by establishing centers of excellence, which can help drive rapid, targeted improvements in the quality of training. We, at Toyota, stand strong for this noble cause through our social initiative of establishing Centres of Excellence in association with various colleges and institutes across the country, providing more comprehensive learning opportunities for the students at the grass-root level. Being a responsible corporate citizen, our objective is to empower the students to be future ready with desired skill sets and competencies, while contributing to the nations’ growth and Industry’s employability ratio.” he added. The company has been tirelessly working towards enhancing the employability quotient in the automobile manufacturing industry across India, by promoting unique skill sets. As a part of its commitment towards developing world class skilled workforce for the emerging Indian Auto Industry, Toyota in 2007 established the Toyota Technical Training Institute (TTTI) which offers a three-year rigorous full-time training in – Automobile Assembly, Automobile Paint, Automobile Weld and Mechatronics (a combination of mechanical and industrial electronics) to financially challenged students hailing from Below Poverty Line (BPL) families from across Karnataka. This institute exclusively emphasizes on over all development of the trainees as per industry requirements & towards “Perfecting people” and there by contributing young multi skilled, energetic, ideal students to the nation. Training Curriculum is a unique blend which focuses on the holistic development of Knowledge (16%), Skill (34%), Body and Mind (50%) of the students. Last year Toyota’s TTTI institute accomplished the key milestone of being selected for “Manufacturing Skill Transfer Promotion Programme” under the MoU signed by Ministry of Economy, Trade and Industry, Government of Japan (METI) and Ministry of Skill Development and Entrepreneurship Government of India (MSDE). * Gurukul is a well-equipped learning center at TKM imparts diverse training to employees at all levels which helps them to improve their abilities and thoroughly fulfill their roles. Everyone who works in Toyota experiences 70% of their development through the job itself; and the experience serves as a driving force in developing the next generation. * Toyota Apprentice Scheme (TAS) – Under TAS, TKM has trained over 12,000 Apprentice Members (ITI, Diploma and Engineer) since 2002, which makes it one of the largest sources of providing such manpower to the industry. * National Skill Contest– Launched in 2014, National Sales & Service Skill Contest is an initiative that provides Toyota’s dealer sales & service personnel to showcase their skill levels with a view to identify gaps and improvise. Held at three levels – across dealership, regional and national levels, the contestants are evaluated on various parameters such as knowledge, process demonstration, soft skills and role plays among others. Continuous training skills are imparted to hone the dealer personnel skill sets to meet the growing expectations and deliver Toyota’s best-of-all Quality, Durability & Reliability for ultimate customer delight.